Today my e-book monograph Pocket Guide to American Freeform launches! First created for the American freeform Bundle of Holding, this guide takes you through the history of the format, as well as offering instructions for how to play, write, and run games in the style quickly and safely. 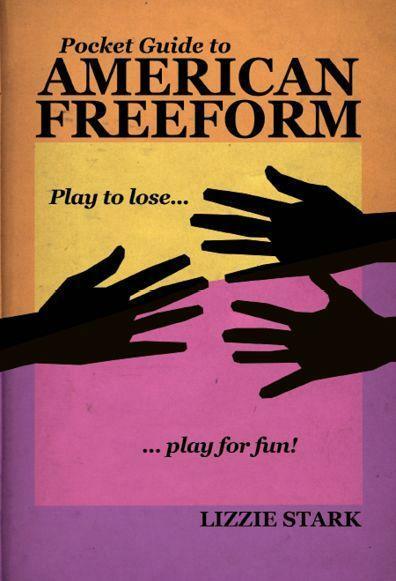 The book contains an adaptation of several posts on workshops and debriefs from this blog, plus new material on the history of American freeform, safety in roleplaying games, and a guide for players and designers. If you want to do me a mitzvah, leave a little review somewhere? It’s available for $9.50 from online retailers such as Scribd and Smashwords, as well as Amazon and other online retailers. This entry was posted in Blog, Features, Larp and tagged American freeform, freeform, Jason Morningstar, Nick Fortugno, Pocket Guide to American Freeform, Vincent Baker by Lizzie Stark. Bookmark the permalink.